Document Holder - Window Frame Style - Velcro - Holds 1 ¾" x 6 ¼"
Tired of sticky labels gumming up your office furniture and walls? Does writing on the office communication board make your hand cramp? Take control of any flat, clean surface—with StoreSMART's Window Frame Style Velcro Document Holders! 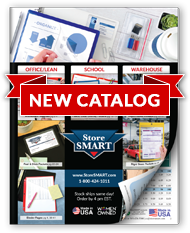 This convenient 1 ¾" x 6 ¼" size is perfect for labeling filing cabinets, desk drawers, doors, warehouse shelves, and visual management displays. Each holder is open on the long side to make swapping paper labels a breeze, and designed to frame your content with an attractive ½" border. The Velcro strips allow you to appoint a location for each label, and then remove and change them whenever you like. Color-code your information to bolster employee comprehension, or utilize a variety of shades to bring a touch of color to your next meeting. Front made of 10-gauge crystal clear vinyl. Back made of 12-gauge solid color vinyl. A ½" color frame remains around labels/documents once they're slipped inside. Opens on the long side for ease of use. Two ¾" x 6" Velcro strips on the back—both hook and loop sides. The exterior half of each strip is coated with a permanent adhesive. Overall size: 2 7⁄8" x 7 3⁄8". Inside capacity: 1 ¾" x 6 ¼". Businesses: Incorporate our Document Holders into your Lean or visual management displays. Label data and daily reports, appoint team leaders, or use them to conduct scrum sessions or process evaluations. Teachers: These holders are ideal for labeling student lockers, desks, or cubbies. They also make great labels for your magnetic dry erase board, chalkboard, or corkboard. Homeowners: Help your family keep track of items in the garage by labeling shelving, or use them to create "clean" and "dirty" labels for a variety of appliances (such as your dishwasher and washing machine).